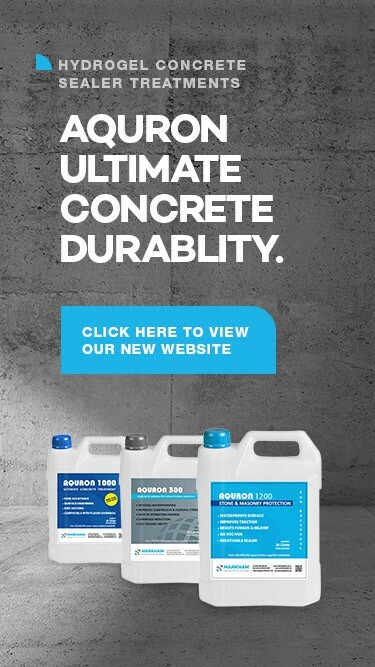 AQURON 1000 offers concrete curing, concrete hardener and a final finish in one treatment. Spray applied AQURON 1000 is the ULTIMATE concrete hardener for high performance concrete floors. AQURON 1000 has two unique differences compared to traditional hardeners. AQURON 1000 being colloidal silicate has been tested by Australia's CETEC Labs and qualifies for NIL VOC, making this an excellent choice for greenstar building projects. 1. AQURON 1000 is a complete concrete curing assistance (equal to water curing) and concrete hardener in one application. 2. AQURON 1000 deeply penetrating into concrete (up to 150mm) provides internal and surface hardening resulting in ULTIMATE durability of concrete. AQURON is a 100% VOC free, non-toxic colloidal silicate solution that forms a calcium silicate gel within the porosities of concrete. AQURON 1000 provides a easy-to-clean surface that develops a sheen with use. AQURON 1000 does not reduce surface traction. AQURON1000 improves achieved strengths, reduces risk of shrinkage & slabcurl, cracking, surface crazing delamination, while increasing abrasion resistance. AQURON 1000 concrete sealer can be spray applied to new or existing concrete structures. AQURON A1000 is being specified for dense, burnished finished concrete floor slabs, to provide a˜light and even"™ appearance with long-term sheen enhancement and an anti-dusting hardened surface.